Those of us who have lived in Florida for a while know that soon we'll be experiencing daily temperatures of 90° or more. When it's that hot, there's not much worse than standing or walking on asphalt pavement. The asphalt absorbs and retains the heat, reaching temperatures well over 100°. Sometimes it even becomes gooey and sticky. Asphalt is very durable, but the hot Florida sun can be brutal. Just as the sun can damage your skin, it can damage asphalt, causing it to become brittle and break down. 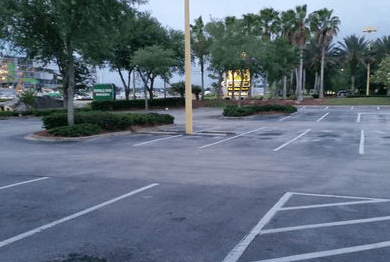 To protect your parking lot from the Florida sun, you need to seal the pavement and provide a barrier between the asphalt and the sun's rays. The sun's ultraviolet rays fuse with oxygen and break down the chemical bonds that give asphalt its strength. Over time, the asphalt becomes brittle and prone to damage. Without regular sealcoating, this gradual but persistent deterioration from the sun leads to all kinds of damage to your parking lot. Perhaps the most noticeable damage is cracks in the asphalt, which are both unsightly and dangerous. Small cracks can be repaired easily, but large cracks can be very costly to repair. Decaying or warped asphalt creates similar problems in terms of signaling your neglectfulness to people using the parking lot, presenting them with a potentially dangerous situation, and, ultimately, costing you a lot to repair. With almost 30 years' experience working on paving and sealcoating in Florida, Liberty Sealcoat has the experience and expertise you need to protect your parking lot from sun damage. We have perfected our sealcoating technique to give your parking lot a durable surface that will stand the test of time. We add our own additives to the slurry mix to improve the bonding characteristics, aggregate suspension and durability of seal-coat materials. We have the advanced tools and equipment to ensure proper sealcoat material adhesion. We offer 3 sealcoating options to provide the appropriate level of protection for your parking lot. Our sealcoating extends the life of your parking lot investment more than 300% and saves you more than 48% on repaving costs. Prepare your Florida parking lot for the summer heat. Call Liberty Sealcoat today at 1.888.957.2836 or contact us online to get your free estimate.